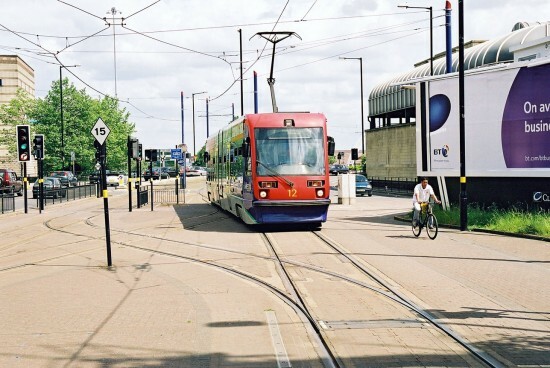 The West Midlands is the location for the latest edition of Picture in Time as we head back to 2004 for an image taken on Midland Metro. In this photo we see T69 12 on the final approach to Wolverhampton St George’s in June 2004 with a service which would have originated at Birmingham Snow Hill. This is the original layout at St George’s when there were still two platform faces with the track leading to the now closed platform visible on the left of the photo. The tram was delivered to the West Midlands from Italy on 16th October 1998 and remained in service until January 2015 when it was withdrawn and stored at Wednesbury Depot. That is where it remained until 23rd March 2016 when it was transferred to Long Marston for further storage. 12 was one of the T69s which was sold for scrap at auction in early 2018. This entry was posted in Picture in Time, West Midlands Metro. Bookmark the permalink.